“Adonai-Tzva’ot says, ‘The fast days of the fourth, fifth (T’ish b’av), seventh and tenth months are to become times of joy, gladness and cheer for the house of Y’hudah. Therefore, love truth and peace” (Zechariah 8:19). Av is the fifth month of the Hebrew calendar which falls in July/August on the Gregorian calendar. 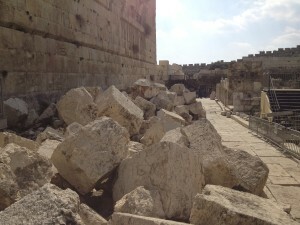 The 9th of Av has become a day of fasting and mourning for religious Jews in Israel due to many catastrophic events throughout their history, focusing specifically on the destruction of the Temples and the exile of their people from the Promised Land. Traditionally, there is no Torah study on the 9th of Av as it is considered a joyful spiritual event. Only books like Lamentations, Job and parts of Jeremiah are read as they relate distressing events like the destruction of Jerusalem or the suffering that faces the lives of the righteous like Job. “Iyov (Job) got up, tore his coat, shaved his head, fell down on the ground and worshipped; he said, ‘Naked I came from my mother’s womb, and naked I will return there. The LORD gave; the LORD took; blessed be the name of the LORD.’ In all of this Iyov neither committed a sin nor put blame on God” (Job 1:20). The events surrounding the 9th of Av began with the account of the ten spies. In Numbers chapters 13 and 14, Moshe sends 12 men into the Promised Land to check out the land. When they return forty days later, ten of the men are discouraged by the ‘giants in the land’ living in fortified cities fearing that they will be destroyed if they even try to go up against them in war. Their fears are passed onto the Israelites who spend the night, the 9th of Av, crying and mourning. “At this all the people of Isra’el cried out in dismay and wept all night long. Moreover, all the people of Isra’el began grumbling against Moshe and Aharon; the whole community told them, “We wish we had died in the land of Egypt! or that we had died here in the desert! Why is Adonai bringing us to this land, where we will die by the sword? Our wives and our little ones will be taken as booty! Wouldn’t it be better for us to return to Egypt?” (Numbers 14:1-4). According to the Talmud (a commentary on the Scriptures), “God saw their tears and responded: “You cried tears of naught, and I will establish for you [on this day] tears for all generations” (Talmud Ta’anit 29a). Consequently, many other historical events happened to the Jewish people and Israel on the 9th of Av that continue to keep the day as one of ‘lessening the joy’ for the Jewish people. The First Temple was built by King Solomon and the united Kingdom of Israel and Judah in Jerusalem about the 10th century BCE. The description of its building is found in 1 Kings chapters 6-8. It stood for about 410 years until it was destroyed in a seige of Jerusalem by the Babylonians and Nebuchadnezzar in 587 BCE on the 9th of Av. After the prophesied 70-year Babylonian exile, the Jews returned to Jerusalem. Under the leadership of Ezra and Nehemiah, the Second Temple built. This Temple stood about 420 years until it was destroyed by the Romans in August 70 CE on the 9th of Av. After the destruction of the Second Temple, the Jewish were dispersed into the nations. The final revolt of the Jews against the Romans occurred in the city of Betar. On July 8, 132 CE, the city of Betar was destroyed and 100,000 Jews murdered. One year later, the Roman commander Turnus Rufus plowed under the site of the Temple and the surrounding area. Both events occurred on the 9th of Av. The First Crusade destroyed French and Rhineland Jewish communities murdering 1.2 million Jews. The First Crusade, which murdered 10,000 Jews in the first month, began on August 15, 1096, the 9th of Av. The Jews were expelled from England, accompanied by pogroms and confiscation of books and property on July 18, 1290, the 9th of Av. They Jews were expelled from France on July 22, 1306, the 9th of Av. On March 31, 1492, Queen Isabella along with her husband, Ferdinand, ordered the Jews banished from Spain. The edict was signed on March 31, 1492 and the Jews were given four months to leave the country. There was a massive loss of property, families became separated and many died by drowning. The final day Jews could live in Spain, thus beginning the Spanish Inquisitions, was July 31, 1492, the 9th of Av. Note: Christopher Columbus sailed the ocean blue in 1492. Though he found the ‘new world,’ in reality he was helping Jews to escape the Spanish Inquisitions. There is evidence that Christopher Columbus was himself a Jew. World War I began when Germany declared war on Russia. This war began a massive upheaval in Europe that concluded with the Holocaust and World War II. World War I began on August 1-2, 1914, the 9th of Av. SS Commander Heinrich Himmler received approval for “The Final Solution” which resulted in the Holocaust and murder of nearly ⅓ of the world’s Jewish population. It was approved on August 2, 1941, the 9th of Av. The mass deportation of Jews from the Warsaw Ghetto to the Treblinka extermination camp began on July 23, 1942, the 9th of Av. Gush Katif was a group of Jewish settlements in Gaza with 8,600 residents. It was known for it’s unique greenhouses that exported more than $200,000,000 in bug-free fruits and vegetables to Europe. For peace with Gaza, all Jewish settlements in Gush Katif were evacuated on August 13, 2005, the 9th of Av. “But in my mind I keep returning to something, something that gives me hope – that the grace of the LORD is not exhausted, that his compassion has not ended. [On the contrary,] they are new every morning! How great your faithfulness! ‘The LORD is all I have,’ I say; ‘therefore I will put my hope in him. …For rejection by the LORD does not last forever. He may cause grief, but he will take pity, in keeping with the greatness of his grace. …Let us examine and test our ways and return to the LORD” (Lamentations 3:21-24, 31-33, 40). “Tears may linger for the night, but with dawn come cries of joy” (Psalm 30:5).